Whether it’s a special occasion, a date night or while traveling, the question of where to go for dinner can be daunting. What type of food? How far do you want to travel? What time? And then once you’ve selected the perfect spot, you call just to find out they don’t have a table. The web won’t magically make a table available, but it will cut down on some of the frustration. When reserving a table online, you’re presented with a list of restaurants that have tables at or near the time when you want to dine. You can sort by neighborhood, price, type of cuisine and time. To narrow your selection, you can read reviews and see a copy of the menu. In general it’s the larger, older and well-financed places that you’ll find on these sites, which includes some of the top restaurants. You’ll have to register and log in to make a reservation, but then it’s just a matter of selecting the place and time and confirming the details. Look for any policies the restaurant may have for confirming your reservation. And, if you’ve waited until the last minute to make your plans, these site are perfect for snagging a table at hard-to-book places that free-up at the last minute due to cancellations. 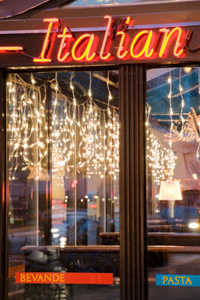 There are several online reservation sites, but the following two are our favorites. They have a large selection of restaurants and are easy to navigate. And, they even gives you reward points for each reservation you make that can be put towards meal coupons. 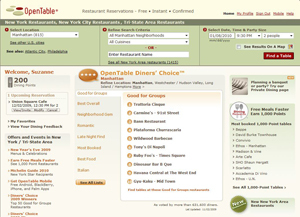 If you’re looking for a restaurant in a major U.S. city, OpenTable is the site to use. It has an intuitive search function that steps you through choosing your location, neighborhood, type of food, date, time and party size details. Mousing over any restaurant name on the results list will bring up a photo, the location and a star rating. You can also sort by price and availability. There’s also an iPhone app that provides availability of nearby restaurants. 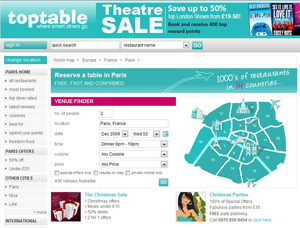 In addition to the U.S., OpenTable covers Canada, Mexico, the U.K., Germany, France, Spain and Japan. Research and book tables in 14 countries, including Austria, Belgium, The Channel Islands, France, Germany, Ireland, Italy, Netherlands, Portugal, Spain, Sweden, Switzerland and the U.K.—without knowing the language. Browse by location, type of food, price and time (dinner, lunch etc). Within the list you’ll find pictures, menus, reviews and special offers. View them on a map or sort by name, offers, or rating popularity. Currently New York is the only U.S. city covered by the site. I love opentable.com. Used it to book dining in NYC, Philly, Orlando and LA. Its a great service and itis FREE!!!!! !